Bloomsbury USA Childrens, 9780802737809, 40pp. 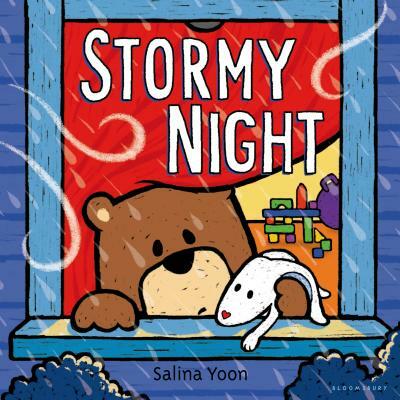 Geisel Honor-winning author/illustrator Salina Yoon's beloved duo Bear and Floppy return in Stormy Night--a charming picture book about facing your fears. When thunder shakes his house and rain pounds the windows, Bear is frightened. But comforting his Mama, Papa, and Floppy helps make the storm seem not so scary. Before Bear knows it, the storm has passed, because even storms need their sleep . . . and so do bears. Prolific author/illustrator Salina Yoon's spare text and bright, energetic illustrations bring to life a story that reminds us that nothing is too scary with family and friends at your side! Don't miss these other books from Salina Yoon! Salina Yoon has written/illustrated more than 100 books for children. Her awards include the 2009 Oppenheim Toy Portfolio Gold Seal, Best Book Award, for both TOYS and ROCK & ROLL COLORS (Scholastic). OPPOSNAKES (S&S) was a 2009 finalist for the CBC's Children's Choice Book Awards for K-2nd Best Book of the Year.